The Excursion 4 Boat lets you take the fun of boating wherever you go! Great for boating or fishing with friends, this roomy Sports Series boat is able to fit four adults and has plenty of space for anything you need for a fun boating trip. Designed with heavy duty, puncture resistant PVC for comfort and durability, and an inflatable I-beam floor for rigidity, the boat contains three air chambers including an inner auxiliary chamber inside the main hull for extra buoyancy and safety. Two inflatable seats with backrests are included for comfort and seating stability. Inflating or deflating is a breeze with a Boston valve on two main hull chambers. Fishing and relaxing have never been easier with the two built-in fishing rod holders and gear pouch. Motor mount fittings are included for the flexibility of adding a trolling motor. Two grab handles on each bow and an all-around grab line are provided for your convenience, as well as welded oar locks and oar holders, a NMMA certified U.S. Coast Guard I.D., and a repair patch kit. 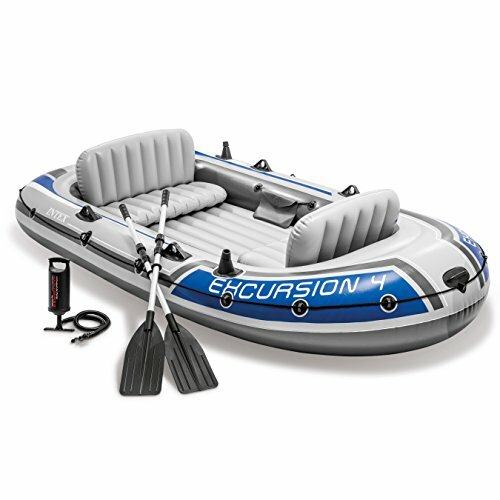 The Excursion 4 Boat Set provides added accessories including: two 54”aluminum oars and an Intex high-output pump for easy inflation and deflation.